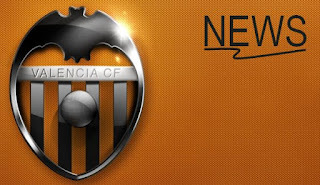 Here are several Valencia news all in one post. First off we have the positive news that David Albelda and Aritz Aduriz have been training with the squad and are nearing their full recovery. In fact they may just be available next week. Goalkeeper Vicente Guaita is coming closer and closer to signing a contract extension with Valencia. He was under a youth contract with a minimum salary, but after excelling as the number one goalkeeper this season after both Cezar and Moya were injured he is set to be here in Valencia for many years. The new contract is set to have a salary of up to 1 million euros per season. In a bit surprising news, but very positive news though, our new signing Jonas has been called up to the Brazilian national team for the friendly match again Scotland on the 27th. In a bit of negative news Joaquin seems to have been injured in the match against Barcelona and along with Maduro won't be available for the Mallorca match.